Update: some better pictures here. Various members of the family, including myself, have been suffering from some sort of bug, so we broke with our usual practice of going to Midnight Mass. 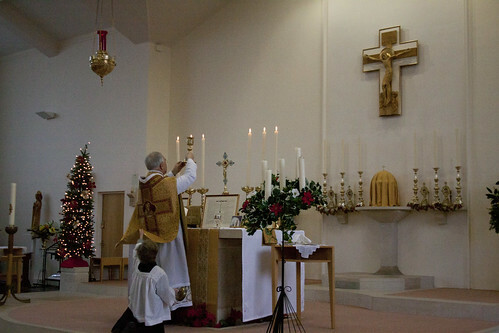 Instead we went to the Second Mass of Christmas, the Dawn Mass, celebrated by Fr Aldo Tapparo in St Anthony of Padua, Headington. Christmas Day shares the special privilege of All Souls Day, on which priests may say three Masses - and so there are three Mass formularies: Midnight Mass, Dawn Mass and the Mass of Christmas Day.